I finished the skirt yesterday! 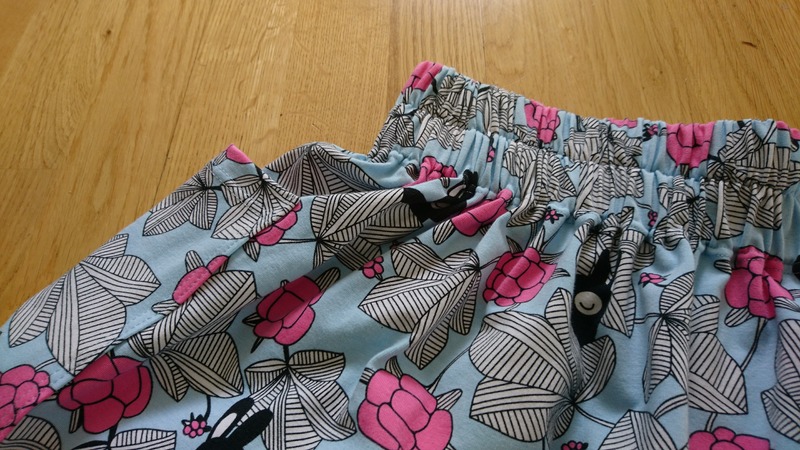 I was a relatively easy skirt to sew, but I did encounter a small challenge when I made the elastic waist. 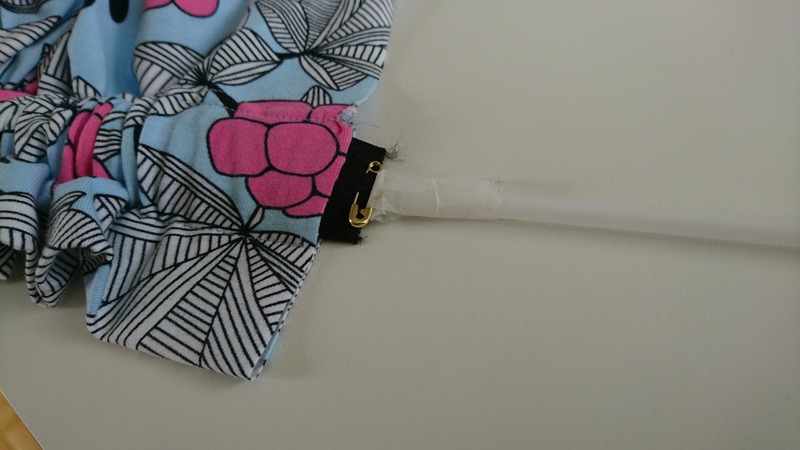 At first it was a challenge to get the elastic band through the very long casing, but I taped it to a long plastic stick and guided it through. 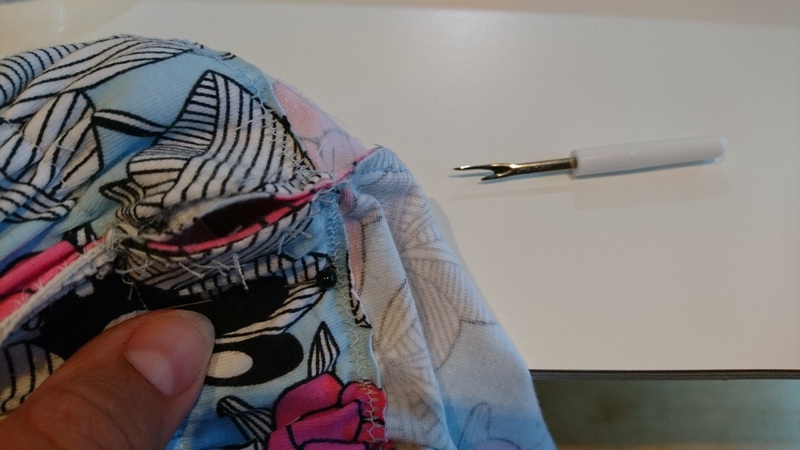 Then, unfortunately, one end of one of the elastic bands got loose after I had sewn them in place, so I had to cut open some of what I had just sewn and then try to get a hold of the loose end inside the casing. 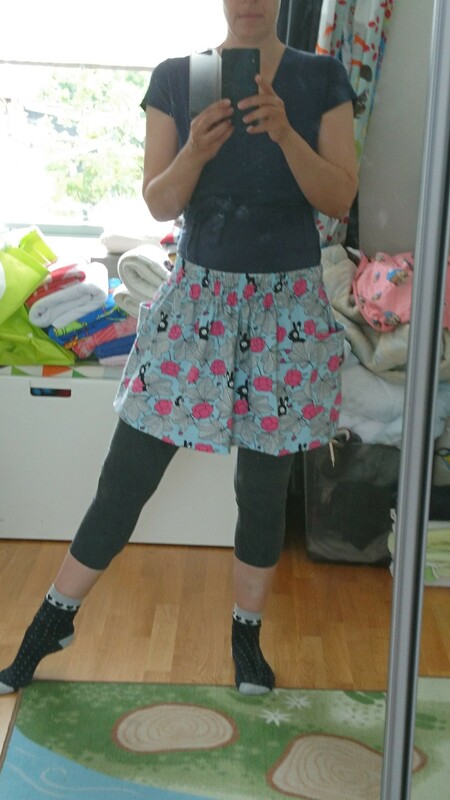 After that I just had to attach the last pocket and then the skirt was finished! 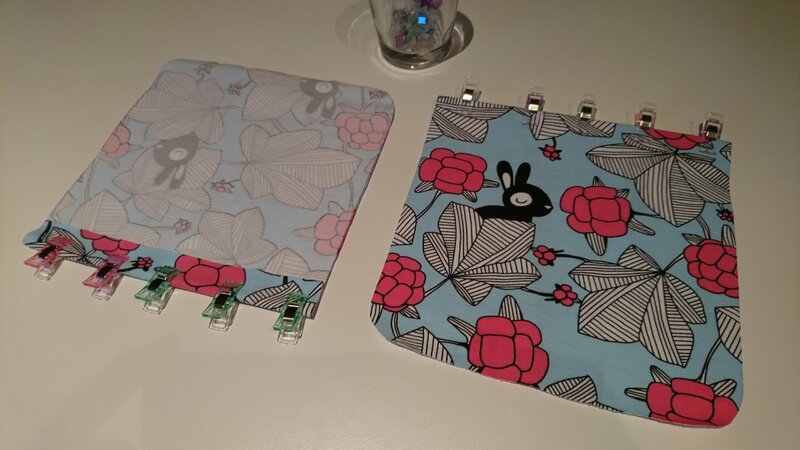 I’ve made the casings for the elastic bands and cut the fabric for the pockets. 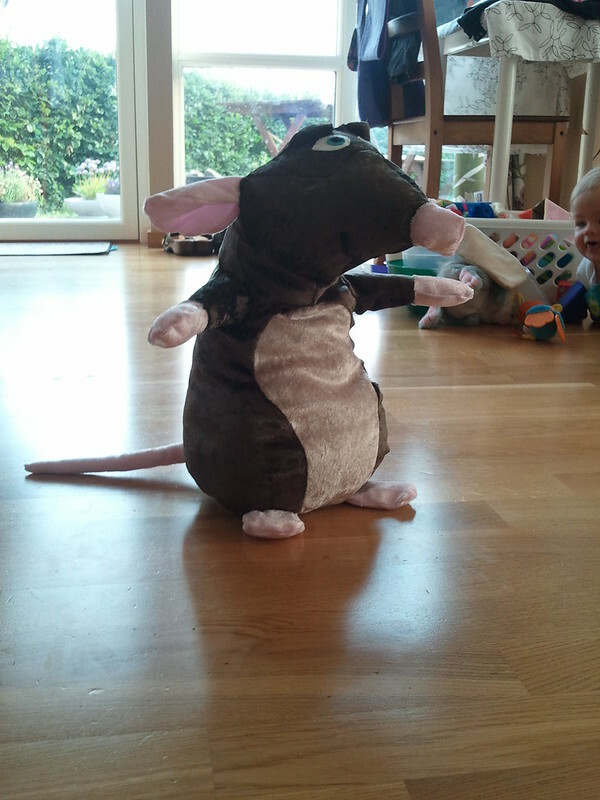 Sewing: The mouse is finished! 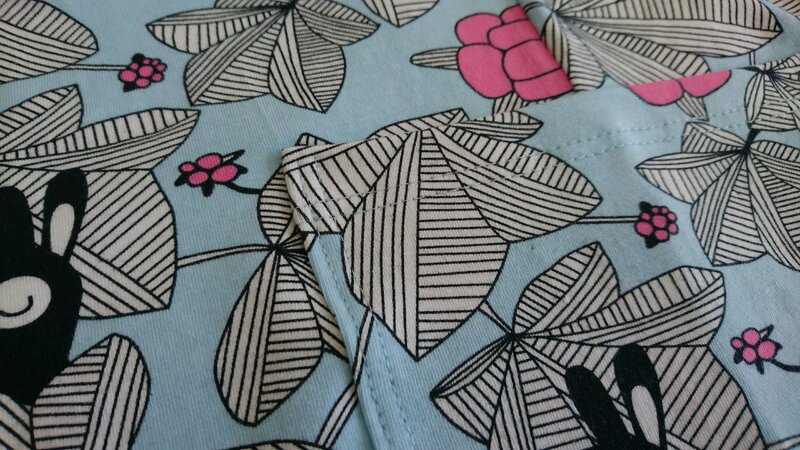 It is actually quite a while ago that I finished sewing it, but I haven’t found the time to blog about it. 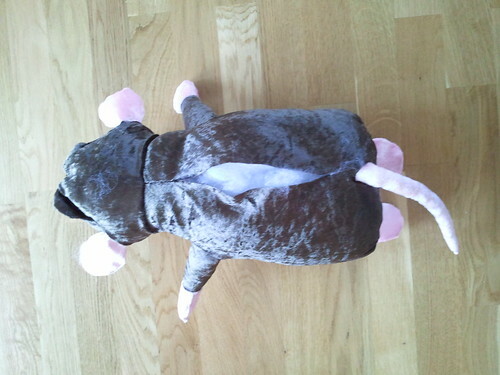 I take that many photos of the process of sewing the mouse, but I’ll show you the few I did take. 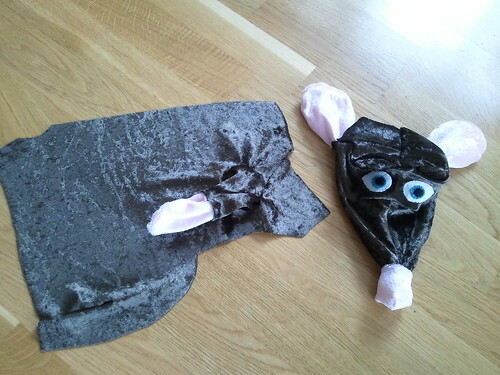 Last time I blogged about making a stuffed toy, I had cut out the fabric. 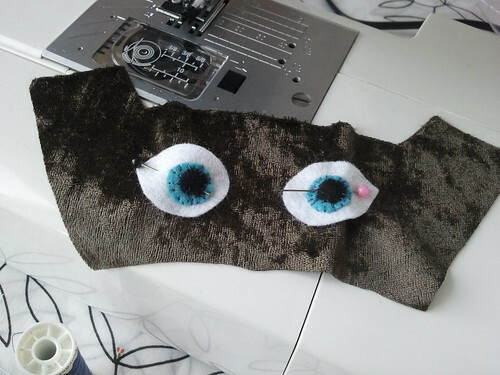 The next step was to sew all the pieces together and I made a quick plan in my head of the process – I decided by starting with the head and working my way down; so first of all I needed to sew on some eyes. 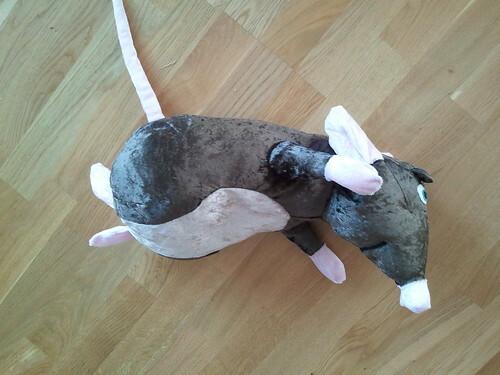 I made the bottom heavy by filling it with plastic pellets and stuffed the rest of the mouse with light fluff. The tricky parts of sewing this was to remember to fill the paws and ears with stuffing before sewing them on and then also attaching the ears turning the right way around (for some reason this was difficult for me and had to do it over twice!). We haven’t named him yet, so far is just known as ‘musen’ (the mouse). It seams like I’ve taking a detour from my learning-how-to-sew by book and went head over heels to making-it-up-as-I-go-along. Hmm… I wonder if this will end well. I used some paper napkins to drape and sketch a pattern based on my beloved rat. After cutting the pieces out I pinned them to the rat to make sure they fitted reasonably well. I then figured out which way the pattern pieces should go on my choice of fabric and used a highlighter to sketch a rough seam allowance around the pieces. And I’m almost ready to start sewing! I haven’t bought the filling yet, and I also need to find some matching threads. 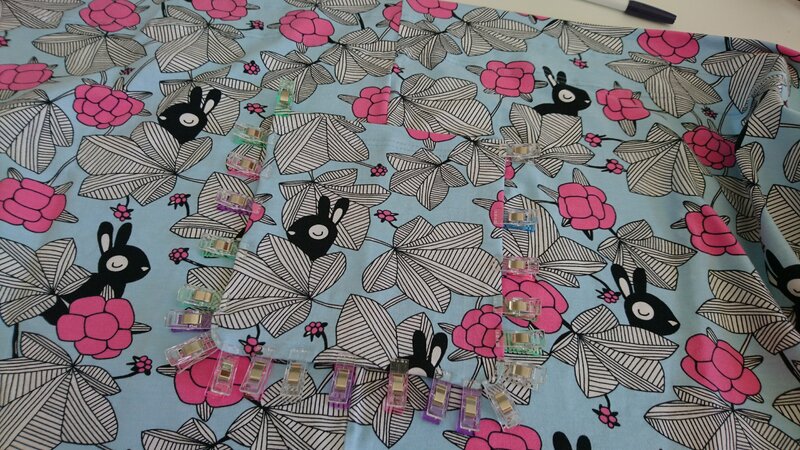 I think the biggest challenge is to figure out a sequence of actually sewing everything together. I see this as a learning experience and am not expecting a great result. I am sure my daughter will find a use for the stuffed toy no matter how it ends up looking. 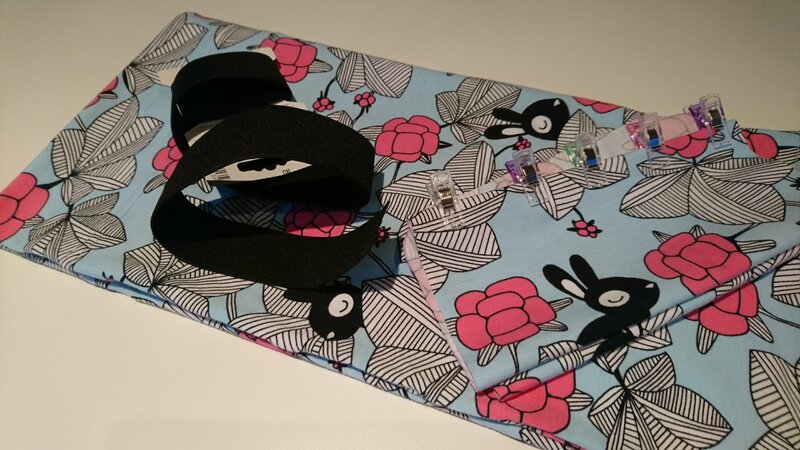 After the success of recycling one of my shirts into a shirt for my cute baby girl, I wanted to repeat the experience using the same type of shirt that I had in white. I didn’t want to stop sewing while waiting for finding the time to go buy some more thread, so I decided to start adding the collar. I wanted to try a different approach than I used last time, so I used white thread and kind of sewed the collar bind piece of fabric first before attaching it. Then I sewed it to the inside of the shirt. And then I basted it to the right side of the shirt. In stead of using a straight top-stitch I decided to use a decorative stitch to secure the collar edge. I quite liked the end result, but I think there must be an easier way to attach an edge to a neckline. Anyhow … here is the finished shirt! I am really happy with the result. The only problem is that I have had to remove the decorative buttons because my cute baby girl likes to use her new teeth on everything and managed to bite one of the buttons off the shirt after having worn it for just half an hour! And safety goes before fashion, so the buttons had to be removed. 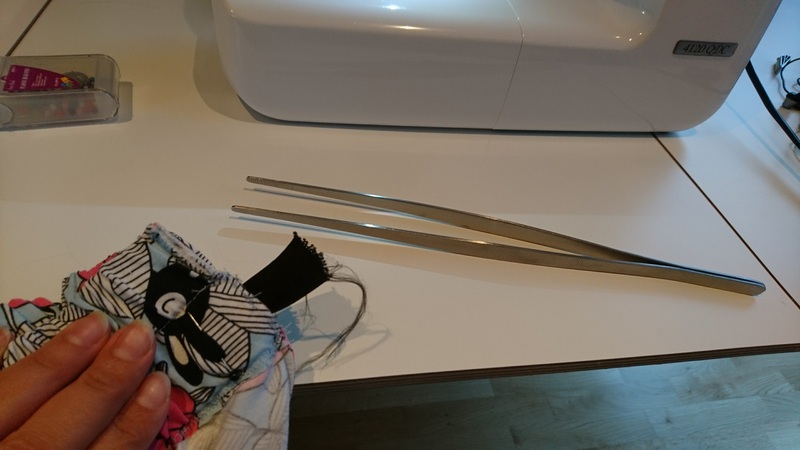 Stay tuned for my next sewing adventure…. a stuffed toy! After the success of sewing the Ladybug pants, I wanted to try to sew a long sleeved shirt for my cute baby girl. I didn’t have a pattern, but I thought “how difficult can it be to make my own pattern” and went right ahead and did just that. I used one of my daughters shirts as a template. As this was my very first attempt at sewing a shirt, and even also just making it up as I went along, I didn’t want to use some nice expensive fabric, so I recycled one of my long sleeves shirt that I never use. 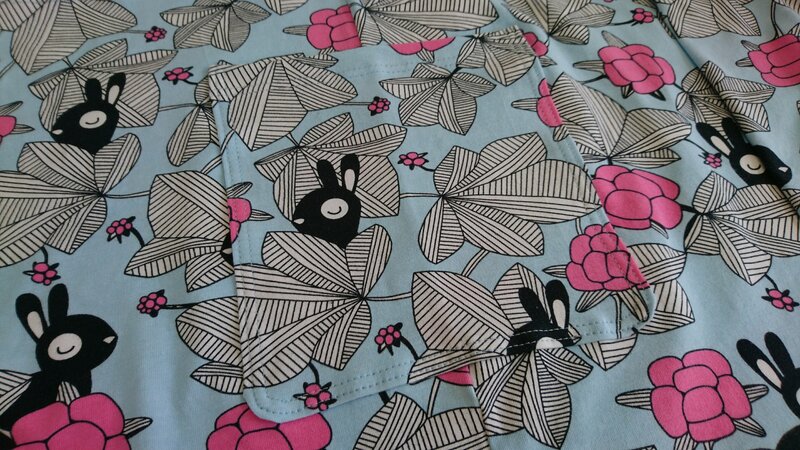 I used some of the ladybug fabric, leftover from the pants, for a detail on the inside of the shirt. I wanted to try using the twin needle for hemming the sleeves, but I realised I needed two spools of thread for that, so I just top-stitched twice. Attaching the sleeves was actually easier than I had thought. 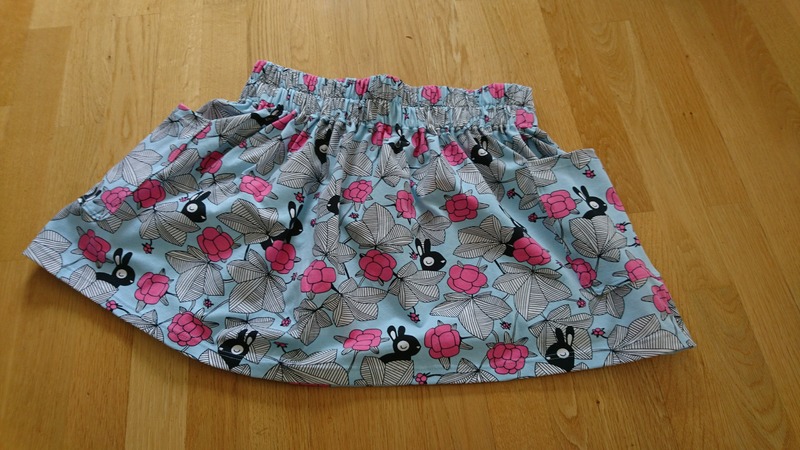 And it was so easy to use an over-lock stitch to them on. And before I knew it, the shirt almost looked like a shirt. If you look closely you can see that I added a little detail on the side of the shirt (a little tag made from the ladybug fabric). Now the neckline was not so easy to do. I’ll try a different approach the next time I make a shirt. The last touch was double hemming by top-stitching twice as done on the sleeves. My baby girl just loved it! Here are some close-ups of the details I added. And the shirt in action.